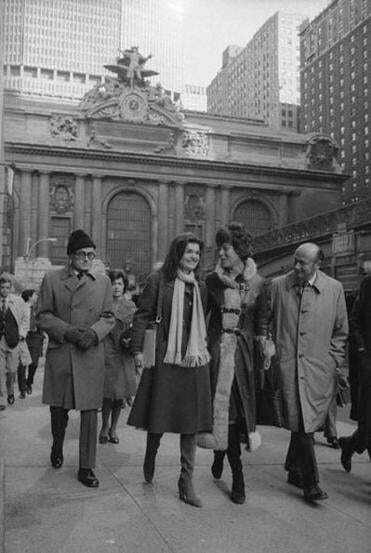 Jackie Kennedy Onassis (second from left) with Bess Myerson, architect Philip Johnson (left), and Ed Koch after a 1976 press conference about preserving New York’s Grand Central Station. Once a person becomes a symbol, it’s awfully hard to become a person again. For Jacqueline Kennedy Onassis, whose roles had included “the first lady, an international fashion icon, a grieving widow” constructing a life of meaning and value, one that resonated with her own ambitions, sounds like an almost impossible task. Looking at the choices she made in 1975, Tina Cassidy argues convincingly that the year Jackie’s second husband died was the year she reclaimed her life. Kennedy Onassis out on the town with Frank Sinatra. This is a compact, distilled biography; Cassidy begins with a tale of two New Year’s Eves. Jackie rang in 1975 with her children in New York, while Aristotle Onassis, fighting the illness that would kill him in March, celebrated with friends in Paris. Their marriage, shocking to Americans whose image of Jackie would always feature mourning black, was already strained (Onassis, a “buccaneer of a businessman” who kept a crucifix and a calculator at his bedside table, had already initiated divorce proceedings). 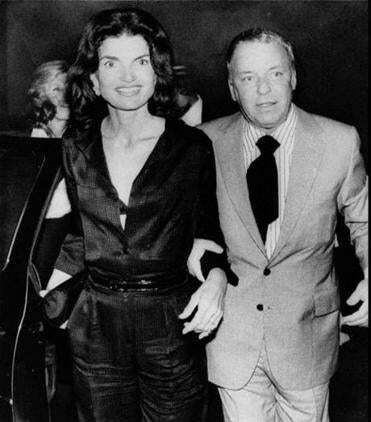 Although she rushed to his bedside in the final days of his life and returned to Greece for his funeral and burial on the private island Skorpios, Jackie spent most of 1975 on her own. Her public and private support of historic preservation, begun during her brief tenure in the White House (which she not only redecorated but essentially reinvented as a living museum of American furniture and design), returned when Jackie took on a high-profile role in the fight to save New York’s Grand Central Station. Seeking more challenges, she then followed her friend Letitia Baldrige’s advice and sought a job in publishing. After first presenting herself to Random House’s Jason Epstein, who quickly regretted his gentle discouragement, she found a more receptive ear in Viking’s Tommy Guinzburg. Viking hired her as a consulting editor, responsible for acquiring projects but little hands-on editing (although, as Cassidy makes clear, she was not afraid of work, nor of expressing her generally incisive opinions). Sections set in the 1970s are juicy fun (names like Sinatra and Warhol abound), and Cassidy sprinkles her narrative with sharply observed social commentary. “Publishing was not the non-profit world, but it was close,” she observes of Onassis’s career choice. Fashion-savvy readers will love Cassidy’s detailed descriptions of Jackie’s wardrobe, including the occasional misstep, as in the Earth Shoes she was spotted wearing at the Viking offices. Cassidy’s attempt to place Jackie’s progression from wife and mother to career woman within the era’s larger social movements is somewhat less successful; it may be difficult for the average working woman to relate to Jackie’s schedule (“Mondays off for the hairdresser, and Fridays off for horse riding”). Still, this story of midlife reinvention is invigorating and inspiring — even for those of us who have to work every day.